Happy New Year / Mutlu Yıllar / La Multi Ani !!! Thanks to a great friend, the Ameeta Scarf knitting pattern is available into Swedish language too. Carola was so kind that she translated the pattern from English to Swedish. This knitting pattern is easy to knit. The pattern stitch is easy to remember too, it requires only knit and purl stitches and it produces a very textured fabric which is reversible too. 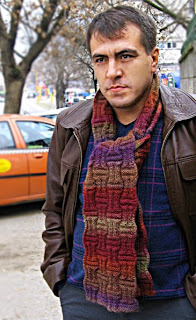 The scarf is unisex, it can be worn by men and women too, it only depends on the color scheme. Ameeta scarf free knitting pattern in Swedish. Very nice pattern and the colors blending into each other look good on the scarf.A nice possession. Very nice pattern and the colors blending into each other look good on the scarf. Will this apply to girls to? Thanks to the service if your friend now the people from sweden who likes to net can make one.